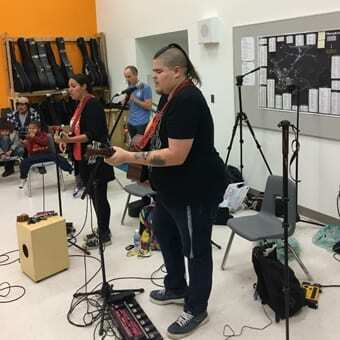 ArtsCan Circle sends teams of indigenous and non-indigenous musicians & artists to remote Indigenous communities engaging groups of children and youth in workshops to facilitate creative expression and teach skills in playing musical instruments, songwriting, visual arts and performance arts. Artists and musicians need to be team players who are flexible, creative and resourceful. Each team is carefully chosen to provide a balance of skills in the facilitators in a variety of areas. New musicians and artists are mentored by experienced team members who have previously worked in the community. The teams will generally spend a week in the community and may be asked to travel on a weekend day. Experience with children of various ages is an asset as we may provide workshops to groups of students in Kindergarten through High School. Previous knowledge of Indigenous Culture is helpful as we try to incorporate the local culture and honour local traditions and language.